So, everyone has their own little pet irrational fears, right? I sure do. My big one is being buried alive. No idea where that one comes from...but just imagine the horror. No. Not going there. This scene from Kill Bill alternately inspires and scares the living bejeezus out of me. When I've shuffled off this mortal coil (or, aheam, appeared to have enough), cremate me, please. I wish to take no chances. To a much lesser (though perhaps more realistic) extent: Scurvy. Not that I have a great grasp of what it actually is. But it just sounds so...unpleasant. And it can be deadly. Or maybe just mostly deadly, just enough for everyone to think you've crossed over to the other side, have your burial, just for you to wake up...ugh, there I go again. Anyways, scurvy adversion must be high on my priority list, because I love me some citrus, especially mandarins and clementines and all sorts of goodies chock full of Vitamin C. At family meals where clementines are present (like a holiday brunch), it's not uncommon for me to chow down at least four while wondering how many more I can sneak without my mom or sister-in-law giving me the stinkeye. It's practically tradition at this point. 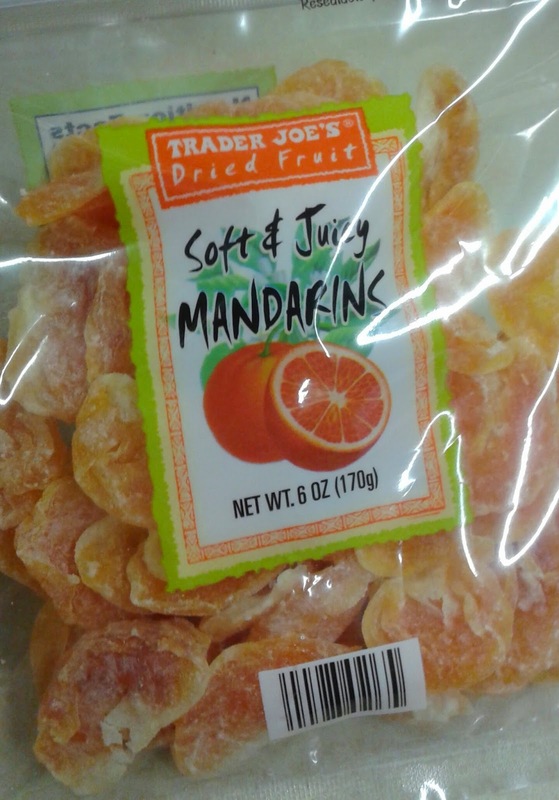 Here's another great way to enjoy them: Trader Joe's Soft & Juicy Mandarins. No peeling. No sticky fingers. No random juice puddles, and the chances of a stragglin' seed are pretty slim. No potentially offensive odors (I have a coworker who has a reaction to even the smell of oranges). Just soft, juicy, ultra sweet mandarin sections. Each piece, though dried and tissue-y feeling on the outside, still has a fair amount of squish inside. It's not like the firm flesh of a fresh fruit, of course, but that nice dried feel, like a dried apricot. With a little imagination, like a big, soft jelly bean or so I told myself eating them over the past week or so while the coworkers were passing around the Jelly Bellies. A lot of the natural flavor comes through, too - so sweet and tart, like a fresh segment - despite the added sugar that I somehow missed in the initial version of this post. Ugh. Why do that to some perfectly good fruit? Or add sulfur to preserve? I'd prefer neither to be there, but the end result (unlike these abominations) is tasty enough that I don't wish to create a huge fuss about it either. Edit, note, and move on. Anyways, it defintiely takes some restraint for me to not eat the whole bag over the course of just a shift or two at work. It's an easy reachable munchie that's pretty darn healthy, for a good price too (about $3). 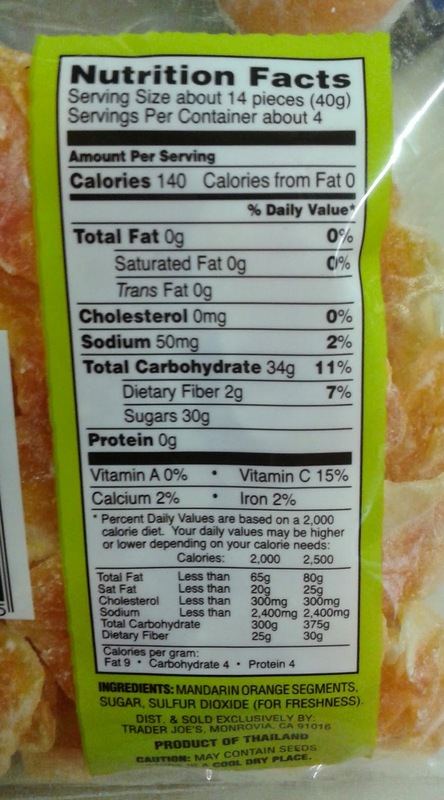 The soft 'n juicy mandarins are tentatively joining my usual work snack rotation - oh, if not for the added sugar... Sandy likes 'em quite a bit too just for their kinda-candy-but-not vibe and quick bite pick me up value.She gives them a four, while I have to slide in a little lower. I hate to break this to you, but there is added sugar in these... sugar is in the ingredients list right before the sulfur dioxide. My bad! Blaming the intern for that. Edited version now posted. No added sugar? Ummmmm, how closely did you look at the ingredients list? Not closely enough! Edited version now posted. Thanks! Maybe a little sugar in them but at least you don't have to lose sleep worrying about scurvy. You should watch the movie "Buried," starring Ryan Reynolds. It takes place entirely inside a coffin. You lost me at "starring Ryan Reynolds." Then you really, really lost me. As an employee we did a lot of side by side comparisons, and the dried fruit with sulfur and sugar was always better and juicier then the plain stuff! As far as these go, most employees LOVED them, and I really didn't find them that tasty!